Continuing with a legacy that has spanned a dozen years, Pi Kappa Phi was named the top fraternity at Purdue in 2019. 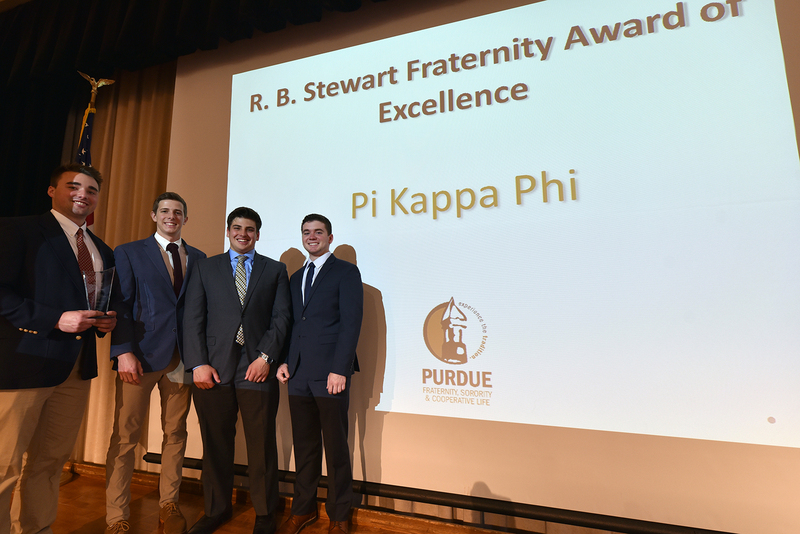 On April 8, the chapter won its second consecutive RB Stewart Award, signifying it as best on the Purdue campus. It was also the 9th time in the last 12 years the chapter has been recognized as such. Furthermore, Nate Longo was named the Steven C. Beering Outstanding Interfraternity President of the Year, too. There were five finalists for the top chapter award, according to associate dean of students Brandon Cutler. “Multiple chapters are considered finalists and are then screened for excellence in the following categories: Academic excellence, community service, philanthropic engagement, health & safety, alumni engagement & outreach, membership growth & retention and leadership,” he said during the awards ceremony. In the Fall 2018 semester, Pi Kappa Phi was No. 1 in service hours, No. 1 in philanthropy dollars raised, No. 3 in chapter size and No. 4 in average GPA among Purdue’s 41 fraternities. And Pi Kappa Phi had significantly more service hours – nearly three times the closest competitor – and dollars raised for philanthropy – more than 2.5 times the closest one. It also boasts the co-chairman of Old Masters, a campus-wide program to bring alumni back to campus to share their success stories, and IFC president. Chapter members also hold executive positions in the Purdue University Dance Marathon and Boiler Gold Rush. Longo was a key component in that success, which led to him being named the top fraternity president. Longo, a junior from Dublin, Ohio, is an electrical engineering major. He a 4.0 cumulative GPA and is the 2019 IFC president. He was humbled by winning the award. “I cannot fully express my gratefulness to my fellow chapter leaders and members who really did a lot of the legwork to allow our chapter to excel,” he said. “I focused during my term to better the chapter, continue to win awards such as the RB Stewart and to develop young men into leaders, including myself.